Weatherization is a chance to improve your home's energy efficiency without making major modifications to the overall structure of the house. It should involve a whole-house systems approach that considers all aspects of energy efficiency, safety, moisture control and the durability of the structure. Test for leaks first, make your improvements, then test the home again. A whole-house approach to home performance includes a number of before-and-after tests that check for air leakage and measure the performance of the hvac systems. A good first step is hiring a home energy auditor to evaluate the performance of your home. A professional auditor will most likely use a blower door, Duct Blaster and infrared camera, as well as other tools, both to quantify and qualify the energy wasting areas of a house. After the testing, the work begins to take care of the problem areas, and when it is finished, the auditor will come back to retest. The results of his 2nd visit tells you how well the improvements you made are working. Before any other improvements are made, it is vitally important that air leaks must be sealed. Insulating a very leaky house is counterproductive, and it makes it more difficult to find the leaks in the future with new insulation piled over the top of the leaks. 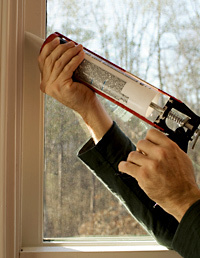 Will weatherizing really help to make the home efficient? Some homes may not be worth the improvements until structural issues or severe site or plumbing problems are taken care of--problems that would be beyond the expertise of a weatherization contractor. Issues may include mold in a bathroom that doesn’t have proper ventilation; water leaks in the basement; or weak foundations or the framing of the structure. Some energy problems are people issues not buidling issues. Leaving lights on 24 hours a day, not using exhaust fans in the bathrooms or the kitchen and leaving windows open in winter, educating your family may be as important as anything else.